Isn’t it amazing how in just a few years a child can go from verbally expressing themselves only through ear-piercing cries, to communicating effectively with adults using a wide vocabulary? As children grow and accumulate new knowledge, their brains are physically changing too. Every new piece of information and experience a child has shapes the way their brain develops—this is called ‘brain plasticity’. The effects of brain plasticity are most obvious in children, who encounter new information and sensory experiences every day. The good news is that our brain remains ‘plastic’ throughout our life, though in different ways than during childhood. This is to say, if we put ourselves in new environments and seek out new experiences in adulthood, our brain undergoes physical changes. Our brain’s neural networks—neurons that communicate with each other through synapses (electrochemical signals)—change as we use our brain to learn a new language, reminisce on the past, or even perfect a yoga pose. As we repeatedly practise a new skill and engage in learning, pathways form between our neurons; these pathways become wider and more well developed the more our brain uses them. Similarly, if we stop learning new information or developing new skills, these connections weaken. Recalling memories, for example, can become more difficult if you are out of practice. This is why it is so important to commit yourself to making learning a lifelong practice. Learning new skills and knowledge throughout your adult life has benefits beyond just the particular content of what you’re learning; it helps strengthen the neural networks in your brain to keep your mind in peak performing condition. Success is also great reinforcer—when you achieve true mastery in a skill, you like to keep doing it again and again and again. This in turn helps you become even more successful. 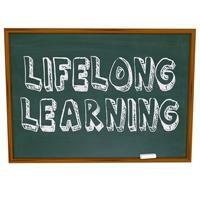 The most important skill you gain from undertaking any sort of learning, however, is discovering how you best learn. Once you understand your intrinsic motivations for learning new information or skills, you’ll find that creating a habit of lifelong learning is not just easy, it’s one of life’s greatest joys. Are project managers afraid of their own genius?